If you saw my post on the vanity fixture I got for my "bling bling" bathroom then you know I love, love this chandelier. It was not pricey at all but looks amazing. I get so many compliments on this. Venetian Italian Style 4 Light Golden Teak Crystal Chandelier Medium 23" x 25"
This stunning 5-light Chandelier only uses the best quality material and workmanship ensuring a beautiful heirloom quality piece. Featuring a radiant chrome finish and finely cut premium grade golden teak colored crystals with a lead content of 30-percent, this elegant chandelier will give any room sparkle and glamour. Dimensions 21.0 In. X 21.0 In. X 26.0 In. it is absolutely beautiful! I have always wanted one and now that I am adding a bathroom I want it to be very elegant, which this chandelier is! "Is this chrome or is it Brass? The title says Chrome, but the specs say Brass with a Bronze finish. How many sizes does does the collection have?." Hello Gatsby, we do apologize for the confusion. This item does feature a polished chrome finish. Please feel free to contact us again with any further questions. Thank you for shopping with us! 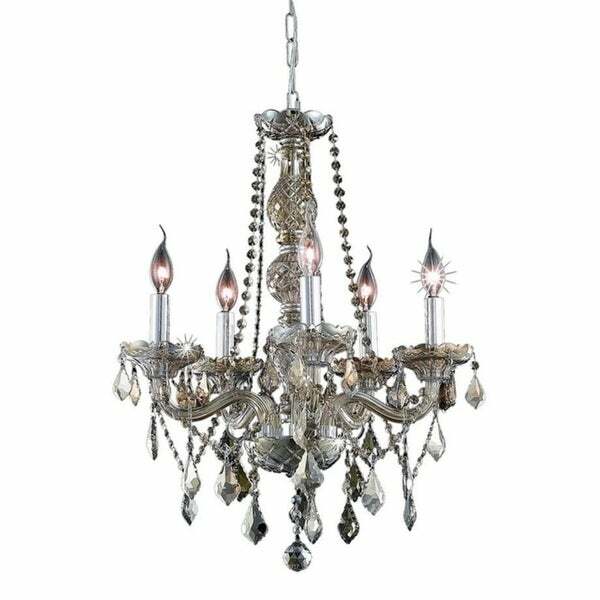 Venetian Collection 8 Light Chrome Finish and Chrome Crystal Chandelier 28" x 34"